It’s no secret that growing a property investment portfolio requires as much of the banks money as possible. The question is how do property investors obtain the banks money in the most optimal way? At Confidence Finance, we’ve simplified today’s investor finance market into one key chart. 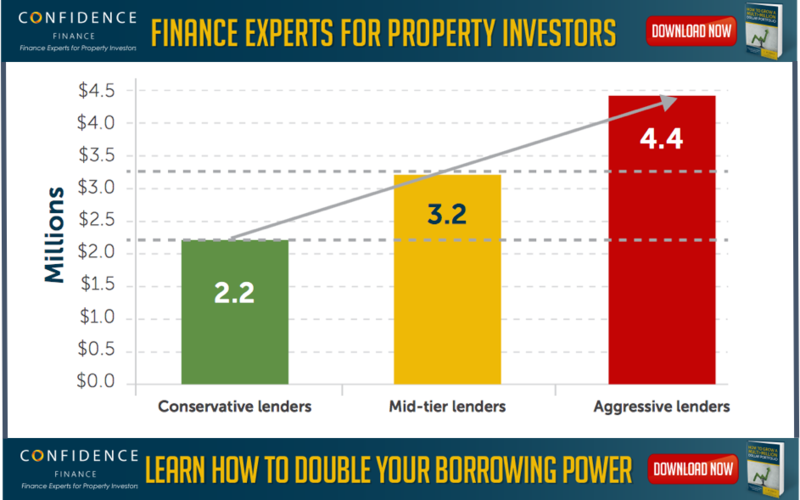 This chart shows how eleven key lenders approach property investors today. Each lenders’ line tells a story about a their attitude & risk appetite when lending to property investors. This chart shows how much a young couple can borrow to purchase an owner occupier home. It shows how their borrowing power falls as they take on more investment debt. In this example, this couple earn $70k gross p.a. each with no other debts, lender calculated minimum living expenses & a $6k credit card. In the three-scenario’s modelled, this couple have (a) no investment portfolio, (b) a $1million portfolio; and (c) a $2million portfolio (at 80% loan to value ratios). The good news is that the science behind the calculations also reveals how to set up your finance structures to match your investing goals. Dissecting how lender calculators work brings to light a rich information set that property investors can use to help inform decision making. Looking to borrow as much as possible? 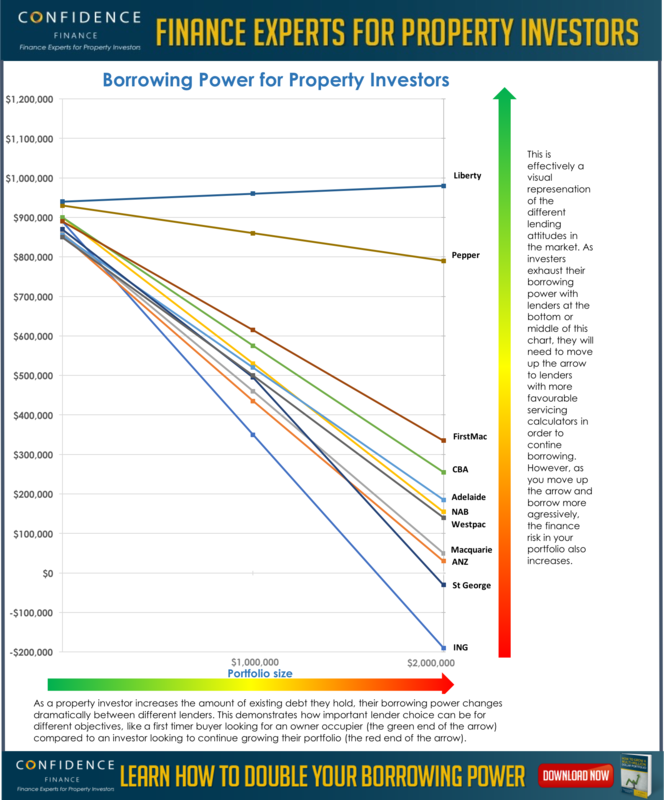 This chart tells you which lenders offer greater borrowing power. Looking for answers as to whether to be on principle & Interest repayments or high rate interest only loans? This chart provides useful information about the borrowing power benefits of interest only loans. Curious whether to be on a variable loan or a fixed structure? This chart reveals some of the costs of being ‘fixed’ with a lender & their specific borrowing power calculator. So, how do property investors use the rich information here to finance a multi-million dollar portfolio & inform loan decisions? In short, investors can manage the differences in lender calculator results to expand their borrowing capacity. To do this, a property investor needs to carefully plan their loan structure & lender choice from their first purchase. At an extreme end, property investors can obtain non-bank funding to double their individual lender borrowing capacity. This is a high-risk finance strategy, and one, I’d caution most investors to think twice about. Below is a detailed breakdown of each individual lender calculator used in this modelling. This information helps shed light on answering key questions as part of an investors finance plans. ING have a higher than usual 8% assessment rate across all debt. Their policy, products and pricing aligns to their target market – first home buyers &set and forget owner occupier mortgages. ANZ have a relatively conservative position for advanced investors. This is because of their conservative negative gearing add-back position and higher than average living expense calculation.They can be a suitable starting point for investors. As a major bank, they do target specific types of loans well with policy niches (e.g. guarantor loans). Macquarie were previously one of the most aggressive lenders in the marketplace but have had a large scale-back in borrowing power for investors. A decent policy suite, great loan product & good technology make them a useful lender in the marketplace. NAB’sliving expense calculations rise as income rises, which again, hurt property investors who earn significant rental income. As a major bank, they do have some nice tools for property investors (e.g. desktop valuations). They have competitive on pricing (e.g. first home owner 2 year fixed at 3.69%) for a major bank. St George & Westpac have had the most recent changes to their lending calculator, scaling back to the ‘pack’ of APRA lenders. Their size, lending policies & product make them a good foundation lender for new investors. CBA very much have an APRA calculator too, except for one noticeable difference to their loadings that they have on types of OFI debts. Low rate P&I debt is treated relatively favorably compared to most lenders (@ about 5% P&I vs 7.25%). They also have a decent negative gearing addback. This makes them relatively more powerful for investors who want to extend their borrowing power but do so in a conservative manner (P&I lending & APRA lender calculators only). e. those who have a non-tolerance for risky lending. Pepper’s calculator is strong. They allow lending above 80%, making them one of the most powerful calculators in LMI territory. Specifically, they allow100% of non-stable income to be used and they have about a 30% loading on existing debt repayments. Liberty have a powerful calculator, built on taking ‘actual’ repayments on other financial institution debt. Have a lot of interest only lending with other lenders (typically property investors? ), Liberty offer the greatest borrowing power. Interestingly, this is where a number of major lenders were a few years ago! More analysis and a detailed explanation of how to manage your borrowing power is available in our E-book: How to Grow a Multi-Million Dollar Portfolio. At Confidence Finance, we believe that long term property investing is a game of finance and property finance is a science. We believe that lending can be broken down into individual components. Understanding how each part works is our specialty. We use this insight to develop a unique understanding about how lending works in Australia. We then use this expertise to help our clients grow, finance and protect successful property portfolios. Redom Syed is the CEO & Founder of Confidence Finance. He has been recognized as one the Top 100 brokers in Australia and was nominated as Australia’s Best Young Broker in 2017. He has personally settled over $150 million in lending. Prior to becoming a finance specialist, Redom worked as a Senior Economist at Federal Treasury, where he became a published author on the design of the International Financial System.